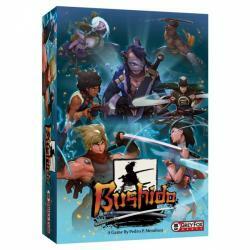 Grey Fox Games will release the two-player fighting board game Bushido and its first expansion, Bushido: Rising Rage, in Q1. Designed by Pedro P Mendoza, the game has two players complete in head-to-head combat after training hard and drafting the techniques they need as fighters to win (represented by dice and cards). Then each combatant picks a weapon to bring to the fight. Once they enter the dojo, it’s a duel to the death. The box includes 2 player boards, 10 attack dice, 5 evade dice, 2 life dice, 31 technique cards, 12 weapon cards, 10 torii/armor tokens, 16 rage tokens, 2 hit tokens, 2 guard tokens and 4 lock tokens. The game is for 2 players, ages 10 and up, and plays in 30 minutes. 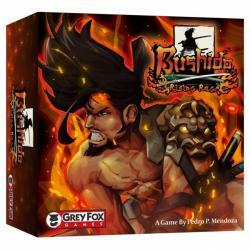 Bushido: Rising Rage is the first expansion for the game. Combatants have learned to harness the building hate inside them as a battle force. New dice allow combatants to gain rage more easily, and there are new technique cards and new weapons which capitalize on harnessing that style. The box includes 5 rage dice, 23 technique cards, and 8 weapon cards.